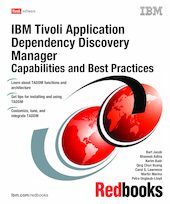 In this IBM® Redbooks® publication, we describe the capabilities and ways to use the IBM Tivoli® Application Dependency Discovery Manager (TADDM). It is becoming critical for enterprises to track the IT resources in their environment and, more importantly, the dependencies of their business applications on various components. TADDM provides rich capabilities that discover the components of a complex infrastructure and their interdependencies. In this book, we provide insight into the TADDM capabilities and architecture. We include recommended procedures for installing and configuring TADDM, tips and techniques for populating the TADDM database and customizing its use, performance considerations, and information about how TADDM integrates with operational management programs.